Cleopatra's Pyramid Video Slot Review - Casino Answers! Cleopatra’s Pyramid is a 5-reel, 20-line video slot developed by Vegas Technology, featuring a wild symbol, scatter wins, multipliers, a free spins feature and a bonus game. You can play the Cleopatra’s Pyramid video slot at Bovada. Bets on the Cleopatra’s Pyramid slot machine are $0.01, $0.02, $0.03, $0.04, $0.05, $0.10, $0.15, $0.20, $0.25, $0.50, $0.75 and every denomination of $1 up to $10 per line. You can select from 1-20 paylines on the Cleopatra’s Pyramid video slot. The minimum bet available is a penny per spin up to the maximum total bet of $200 per spin. Cleopatra’s Pyramid has a very good betting range that is suitable for most online slots players. You can manually skill stop the reels by pressing the “Stop Spin” button in the middle of any spin you make. To play the Cleopatra’s Pyramid slot game, select your bet with “Bet One” and press the “Spin” button or simply use “Bet Max” to play all 20 lines. The top paying symbol on Cleopatra’s Pyramid is the Cleopatra symbol. If you land 5 of a Kind, you will win the 10,000 coin top jackpot. The Cleopatra symbol is wild and will substitute for all symbols except for the scatter and bonus symbols. The Cleopatra symbol will also act as a 2X multiplier when substituting in a winning combination. Other high paying symbols are the Eye of Horus and Sphinx symbols, each of which can pay out up to 1000 coins. The Scarab is the scatter symbol on the Cleopatra’s Pyramid slot game. Two or more Scarab symbols anywhere on the reels will earn a scatter payout. If five Scarab symbols appear on the reels, you will win 500X your total bet. If three or more Scattered Scarab symbols appear on the reels of Cleopatra’s Pyramid, you will win 15 free spins at a 3X multiplier. All winnings are tripled during the free spins feature, including bonus winnings (but not free spins). Additional free spins can be won during the free spins feature. You can win free cash by triggering the Cleopatra’s Pyramid free spins feature at Bovada! All payouts are based on the Paytable. Only the highest win is paid per selected payline. All symbols pay left to right in consecutive order, except for the scatter symbol (which pays in any position). Scatter wins are multiplied by the total bet. Scatter wins are paid independent of lines selected. Hit “Autoplay” to open up the Cleopatra’s Pyramid autoplay mode where you can select the number of spins (5, 10, 25, 50, 100, 250 or 500) and number of seconds between spins (1, 1.50 and 2). Stop settings include stop once all spins are complete, stop when jackpot is won, stop if a win exceeds or equals ($50, $100, $150, $200 or $250), stop on any win and stop if credits increase/decrease by ($50, $100, $150, $200 or $250). You can cancel autoplay on the Cleopatra’s Pyramid online slot at any time. Cleopatra’s Pyramid has an excellent top payout, a free spins feature with tripled winnings and a bonus game. Its presentation is by no means top-notch, but as far as game features go, it’s a solid video slot. To play Cleopatra’s Pyramid, sign up and make a deposit at Bovada! 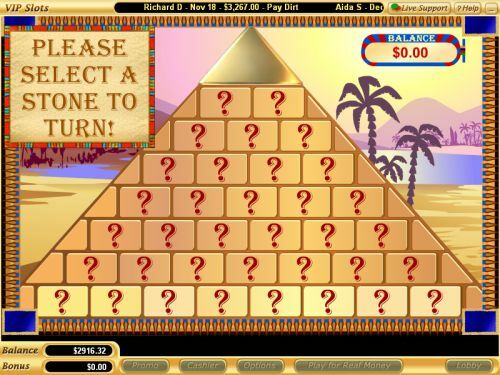 Are players from the USA able to play the Cleopatra’s Pyramid slot game for real money? Yes, American players are welcome to play the Cleopatra’s Pyramid video slot for real money at Bovada. You can also play the Cleopatra’s Pyramid online slot game at other Vegas Tech online casinos. 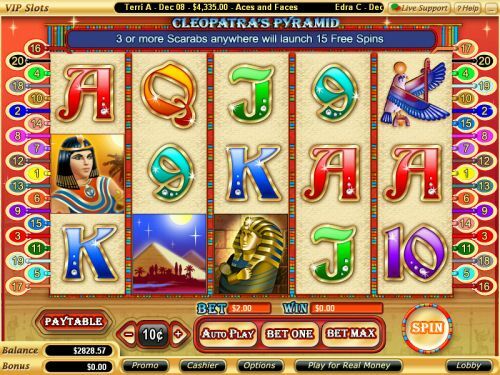 Where can I find a flash version of the Cleopatra’s Pyramid online slot? You can play the Cleopatra’s Pyramid slot machine in your browser at Bovada. You can play in practice mode for free or for real money. If you experience any difficulties with the flash casino, make sure you have the latest version of Adobe Flash Player installed. Where can I play more Cleopatra video slots?